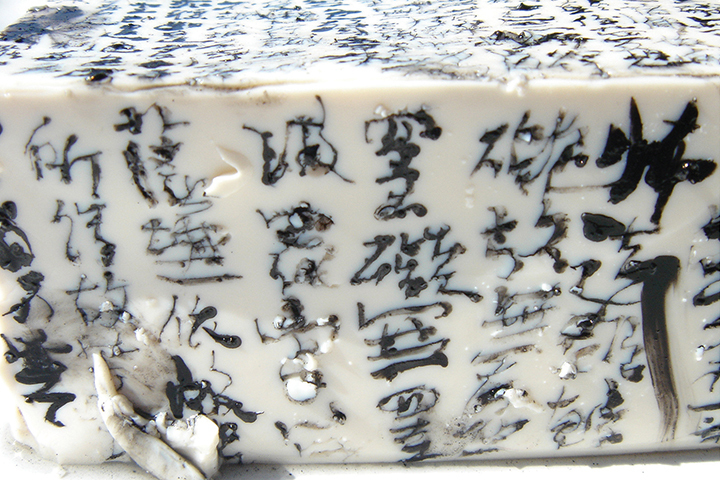 In Tofu Mantra, the artist writes the Heart Sutra, a Buddhist text that the artist has memorized since growing up in Taiwan, in Chinese calligraphy on a fresh block of tofu. The characters of the text on the Buddhist notion of impermanence decays and transforms with the natural texture of the tofu. The work uses an ephemeral material to reflect on the process of change when a spiritual belief becomes materialized. The work started as a performance through the act of writing, became a scripted object, and then is recorded as a time lapse video during the duration of ten days. The following excerpt from the artist’s interview with curator Lesley Ma in 2009 describes the meaning of the text and the work in further details. The Heart Sutra is something that I have learnt to memorize by heart as a child in Taiwan. My family is not particularly religious, so it is curious, even to me, how I became attracted to the scripture at a young age. I used to recite it when I was scared, or simply to calm the mind. The appreciation of the text evolves through different stages of my life and I am still examining it. The scripture describes the Buddhist concept of emptiness and a meditative state in which all phenomena are non-dual. All forms, feelings, perceptions, impulses, and consciousness, the ways by which we relate to the world, are interdependent and each cannot exist on its own. Therefore, the state of emptiness is an understanding of the interdependence between oneself and the universe, and the transient nature of this relationship. This is not a mystical concept and is in fact very logical. For example, to be attached to the beauty of a blossoming flower may cause suffering if one is not aware that the physical form of the flower is constantly changing and that the flower will eventually wither and die. On the other hand, if one understands the ephemeral as a necessary condition of the flower’s being then as one observes the same phenomenon of a flower withering, one is relieved from the unnecessary suffering that arises from an attachment to its temporal state of beauty. This is the basic concept behind the series of works where I write the Heart Sutra onto ephemeral objects such as flowers, mushrooms, and tofu, and which epitomises the materialisation of spiritual truth through the decay and deterioration of the objects.